Amber McElhinney ’19 had to switch her major from equine studies: equine science option to chemical engineering for a semester before she realized that she was where she belonged all along. 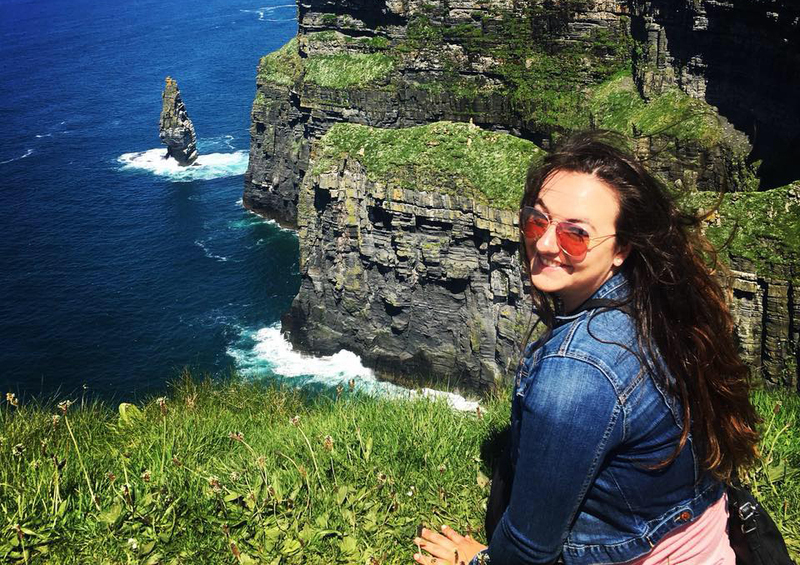 Amber McElhinney: I am most proud of my participation in the Summer Undergraduate Research Fellowship (SURF) abroad program. I earned the opportunity to conduct research on equine cardiology the summer following my junior year at the University of Edinburgh in Scotland. I worked under an equine cardiologist, and was able to assist in clinical cardiac cases that came into the veterinary school hospital, as well as help with field work that two equine cardiology PhDs were conducting. I wrote about this project for my senior thesis. It also provided a strong background in cardiology concepts I'm sure I will use in veterinary school and in my future career as an equine veterinarian. Equine studies major Amber Elhinney '19 holds a horse heart. McElhinney: My goal to pursue a career in veterinary medicine is primarily what has motivated me throughout my time at UNH. Veterinary school admissions are extremely competitive, and this has pushed me to perform my absolute best academically, as well as pursue extracurriculars to gain experience. McElhinney: I chose my major because I wanted to get hands-on experience working with horses, and learn more about equine management techniques. I also needed to be able to complete all of the preveterinary courses, and the equine major allowed me to do both, as well as complete a minor in dairy management. Even though I grew up riding horses, I wanted to have experience handling large animals in a more professional setting. McElhinney: Definitely plan ahead if there is anything specific you would like to do during your time at UNH, such as complete a minor or go abroad. The equine major is small, and so can be less flexible than some other majors regarding when you have to take specific classes. However, this can be worked around to allow you to achieve all of your goals. My experiences at UNH have given me a strong large animal handling background, which I was able to use in my applications to veterinary school. Many pre-vet students have no experience with large animals such as cows and horses, and the proximity of both the equine center and dairy barn to campus has allowed me to take classes learning hands-on skills with both. McElhinney: I will be attending veterinary school the fall directly after I graduate. I have already been accepted to three schools, and am waiting to hear back from others before I make a decision where I will be going. McElhinney: My experiences at UNH have given me a strong large animal handling background, which I was able to use in my applications to veterinary school. Many pre-vet students have no experience with large animals such as cows and horses, and the proximity of both the equine center and dairy barn to campus has allowed me to take classes learning hands-on skills with both. I have also gained a strong science background and research experience here, which have also helped in the veterinary school admissions process. But more than that, these skills will all help me in my career as a veterinarian. McElhinney: I love that UNH has a small school feel with the opportunities of a large university. There is funding available for research and many study abroad programs, but I have also had some very small classes and am on a first name basis with many of my professors. The proximity of the horse and cow barns has also been a huge plus and allowed me to work with animals every semester.